A'Famosa Resort.... a prestigious resort development and with a unique of 'Total Resort Living' concept in Malaysia. The estimate development cost is RM2.6 Billion. The Resort is span over 1,300 acres of lush unspoiled land, offers you a complete leisure haven, a lucrative property investment and capture the essence of history. The resort living within reach and strategically located along the North-South Highway, A'Famosa Resort is excellent and easily accessibility to major towns with good A'Famosa Resort is excellent and easily accessibility to major towns with good infrastructure roads linking to Kuala Lumpur, Genting Highlands, Putrajaya, Seremban Penang, Johore and Singapore. A'Famosa Resort is the only resort in Malaysia to provide a comprehensive range of state-of-the-art amenities and recreational facilities. A host of fun-filled activities for days of entertaining with family and friends are readily available for your comfort and convenience. 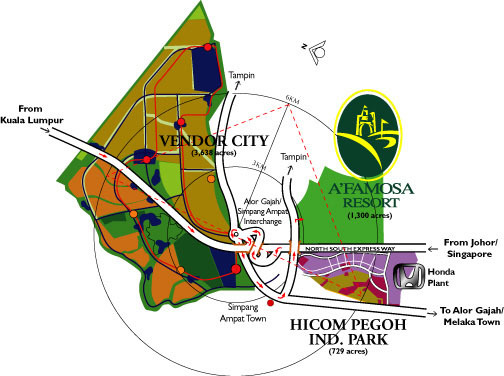 A'Famosa Resort strive to provide an integrated resort project, in its mission to further boost the tourism industry. Invest in A'Famosa Resort, experience the sheer thrill and charm of the fascinating Total Resort Living, as well as the capital appreciation it provides. Our exclusive 326-room resort hotel is located within walking distance of the golf course and clubhouse. The Lobby welcomes you into a world of warmth and impeccable service, so true to the spirit of old Melaka. It's an intriguing world of luxury in traditional settings. Stay on for the day and night, and the next too, and discover that traditional friendliness and courtesy are part of the A' Famosa Resort experience! Everything about the state-of-the-art A'Famosa Resort is extraordinary. 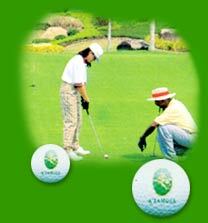 You'll realise that when you see its magnificent 3-6 hole golf course. Designed bythe world renowned Ross C. Watson, it is uniquely crafted to take advantage of the terrain's nature contours - so that, in a setting of lakes, tropical flora and beautiful landscaping, you are faced with the delightful prospect of challenging yourself as never before. For Reservation, please provide Full Name & I/C number upon Booking submission. Rates are in Ringgit Malaysia (RM) and subject to 10% service charge & 5% e-commerce charged if payment made thru Visa/master. Room Rates is included Set breakfast for 2 persons on each room stay. Prepayment is required before guest arrival to guarantee the reservation. Room Rates and designated season as per 2010 Seasonal Chart are subject to change without prior notice. Official Check-In Time: 1600 hrs; Check-Out Time: 1200 hrs. A surcharge of 50% will imposed upon late check out after 1200noon. Cooking and BBQ is strictly not allowed. Falling which PENALTY RM 200 will be charged. * For Reservation, please provide Full Name & I/C number upon Booking submission. 2 Day 1 Night accommodation at Family Studio Condotel. Package valid for Malaysian Market only. For reservation, please provide Full Name & I/C Number. min 3 working days advance booking is required. Confirmation of package is subject to room availability based on first come first served basis. Payments made are non-refundable if package is cancelled or not used. Managements reserves the right to alter, amend, delete or add to these conditions or withdraw the package at any time without prior notice. Package rates is subject to 10% service charge and 5% credit card e-commerce charge.